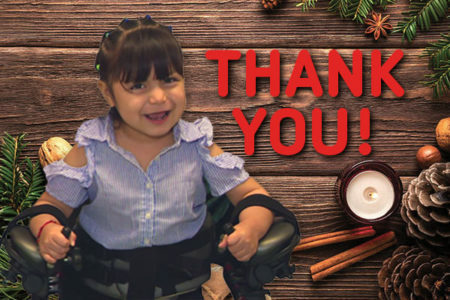 The ADAPT year-end appeal was a great success, raising over $57,000 towards gift cards for children with disabilities within the Early Childhood education programs. A special thank you for the successful fundraising effort goes to PILOT RB and COLLIERS INTERNATIONAL, our two long-time supporters who matched the first $20,000 of donations for our appeal. Each year, we help thousands of children and their families as ADAPT has grown to be the largest preschool provider in New York City. We now serve over 1,200 kids with and without disabilities in 13 locations throughout the city, making a major difference and changing lives every day. This year’s appeal was made even more special as we highlighted the story of Kaylee, a young lady with great determination and an infectious smile, who receives services at our Bronx Children’s Program. When she started school, she was unable to walk on her own or communicate with others. Today, Kaylee is beginning to walk with the support of our expert team of specialists and teachers! Kaylee’s story was featured on WPIX Changemakers, hosted by Tamsen Fadal.